I'm starting a new thread because this question has come up very seriously in the MST-13 thread, but it's really quite a separate issue and the two are difficult to discuss in parallel. I'm copying Longtabber PE's most recent posts below, to kick off. His point about the Mach Stem Effect however seems to be taken directly from the Air Accident report, and Protheroe's explanation of the mistake in the calculation. He has an article explaining what he's on about. Perhaps you could take a look at that lot and assess how justifiable the assumptions are. That report makes a lot of technical sense and I definitely see where he is coming from and going. Similar to where I was going. The big selling point for me is this 20x20 hole with the petaling. Thats consistent with that size charge very close to plate metal. ( I think I said 2-3 feet somewhere earlier) That says placed charge to me rather than the suitcase theory. What would tell me "yes" or "no" in certain terms is an X ray analysis of the entire area paying close attention to heat affected zones at the edges. Its like what I do on machined parts cut by lasers. If the bomb was close and did it- the heat had to hit it and change the density of the metal and thermal shock is easy to see. If it was punched thru as in projectile as a secondary effect- that would be distinguishable too. Were any such tests as these done? I see where microscopy was done but nothing NDT related. Longtabber's next post, and I think we can take it from there. If anyone has said anything about this aspect earlier in the other thread and wants to copy it over, please do that. Toshiba radio cassette players aren't exactly rare, and it wasn't that similar to the Khreesat bomb from the Frankfurt raid, but I take your point. Let me elaborate here and maybe clear up a few points. Its referring to these flags I see and experience. I dont think I have related fully where I'm coming from. This comes purely from the engineer in me and my company and what we do. We specialize in all the process engineering ( TQM, 6 Sigma, Weibull, ISO and all that) as well as RFCA/FMECA, predictive technologies and DT/NDT and the ancillary areas. The thing with anything Japanese ( and bomb makers who use them without sterilizing them) is the Japanese literally live and die on process control and tracibility. On the explosion/device - its about the same. When you break an explosion down into its parts- its heat,pressure and time in infinite combinations- no different than any other ruptured pressure vessel or whatever. Theres a test for almost everything- the question is- did you recognize the need for the specific test and run it. They you compare tests. I do this every day so thats what I start from. I'm simply starting at the cause (2) because in my world, I seldom get #1- I get a box or pallet of mangled "stuff" and the client wants me to determine the cause. So far ( still reading) these people seem to be working from #1- what I'm seeing ( actually, not seeing) is a strong lack of #2 to validate the findings of #1. Thats swimming in shark infested waters with a steak necklace from a professional perspective. I see a lack of detailed testing to validate these different theories. Its like they are throwing propositions out there seeing what sticks. I believe there was at least one trial done where an actual 747 was blown up on a runway to see exactly what happened when the assumed amount of Semtex was detonated in the assumed place. I'm afraid there's so much information here that I haven't read everything in detail. I didn't pay a huge amount of attention to the evidence that the bomb was in a Toshiba in a suitcase with Gauci's clothes in luggage container AVE 4041 in the forward hold, because I didn't think it was disputed. Obviously, your observations seem to suggest this evidence needs closer scrutiny. The bomb was outside the baggage container, and closer to the skin of the plane. This means the AAIB report is fake, again you would have to get an unfeasibly large number of people in on the conspiracy. As Longtabber has pointed out, explosions are complex. If there is any rigourous analysis out there demonstrating that no cloth or paper can ever survive within ~30cm of 1lb of exploding Semtex or TNT then that would be significant. De Braekeleer is the only source for this, and the key part of his proof is in a paper behind a paywall. This looks like a fair cop, but a simpler possibility is that they did not account for enough variables in the Mach Stem analysis, I didn't see any error bars on their estimate. None of the alternatives seems to present a better solution to what brought the plane down, and it seems the simplest intelligence fit up would be to accurately analyse the cause of the explosion, then use a couple of key pieces of fake evidence; bought or co-erced identifications and a piece of pcb to get the guilty party you want. The official story isn't watertight by any means, but I think it takes the CT mindset of "If the official story has even one punctuation error, then what really happened must have been a hugely complex CT", to really doubt it. I'm not entirely certain this is inconsistent with the suitcase theory, but it does raise again the question of placing, which is obviously crucial, but which I hadn't given much thought to previously. It was always acknowledged by the investigators that the suitcase had been placed exactly where it would do most damage, and this was attributed to "bad luck" (that pesky coincidence again). However, if it's correct that 450g Semtex wouldn't breach a plane's hull unless it were close to the skin, then would you just send your suitcase off on a three-hop journey, trusting to luck that the baggage handlers at Heathrow would fortuitously put it exactly where you wanted it? When in fact the higher probability was that it would end up quite some way from the hull, with most of the explosion absorbed by other people's pyjamas? The Official Version has the bag arriving on PA103A from Frankfurt, unaccompanied, and being loaded with the rest of that luggage into Maid of the Seas at Heathrow. The bags on PA103A were loose-loaded, and they were transferred to PA103 on some sort of conveyor system. However, the luggage on PA103 wasn't loose-loaded, it was loaded in pre-packed containers. The container we're talking about was this baby, AVE 4041. At Heathrow this container had about half a dozen bags already in it before PA103A landed. These were from other airlines' flights which had arrived earlier, with passengers booked on PA103. However, there were also two mystery suitcases which appeared in the container while the baggage handler was on his break, one of which was a brown Samsonite hardshell, corresponding to the description of the (alleged) bomb suitcase. You may wonder, given this evidence, why the judges determined that the bomb suitcase had been introduced at Luqa and come in on PA103A - I wonder that myself. In addition, there was additional evidence not presented at the trial (and there is some dispute as to whether it was deliberately withheld) that a break-in occurred at Heathrow on the evening of 20th December, giving access to the airside area in question - a padlock was discovered sawn through. Last edited by Rolfe; 24th September 2009 at 05:43 AM. I may be misunderstanding here, perhaps you can clarify. I think de Braeckeleer is suggesting that the bomb was outside the container, closer to the skin of the aircraft. I think he's concluding that from the sums the AAIB report got wrong, in that the correct sums placed the explosion only (I think) 10 inches from the skin, which is outside the confines of the baggage container. He's suggesting that the entire chain of inference was based on the incorrect calculation, and that if they'd done the sums right in the first place, they would have realised that the bomb could not have been loaded in a suitcase. I would like to know what Longtabber thinks of that theory. I can see from the first post above that he's favouring the "placed charge" version. However, in this context there's quite a bit of difference between 10 inches and 2 to 3 feet. The former is difficult to locate in the baggage container, while the latter is not. My suggestion is that the suitcase wasn't randomly chucked in the container by the crew unloading PA103A, but was deliberately placed in the container at an earlier stage by someone who knew exactly where to put it, who then only had to hope it didn't get moved, or moved too muich, after that. I think the collected luggage debris was analysed very carefully indeed, and at the moment I think it unlikely that a mistake was made when coming to the conclusion that the bomb was in the radio in the suitcase as described. While I'm very interested in what Longtabber has to say, I think we have too look at the entirety of the primary evidence and the conclusions drawn from it before asserting that the conclusions are impossible. Last edited by Rolfe; 24th September 2009 at 05:59 AM. My reading of the AAIB report, including the appendices is that all their analysis pointed to the bomb being in a suitcase in the luggage container, e.g. bits of Toshiba in the plane skin, luggage container blown up from the inside out etc. Appendix G then says that Mach Stem analysis shows the bomb was 25" from the skin, exactly the same distance as their other evidence placed the bomb, everything ties up nicely. If the Mach Stem analysis disagrees with the rest, that's a problem, but it could just mean the Mach Stem analysis is wrong. I agree with the italics, if the bomb was outside the container, all the investigators would have had to agree to ignore evidence showing that, as well as the fact you would need a plausible way for someone to attach a bomb to the inside of the plane without anyone noticing. While I'm very interested in what Longtabber has to say, I think we have too look at the entirety of the primary evidence and the conclusions drawn from it before asserting that the conclusions are impossible. he's favouring the "placed charge" version. At the moment yes but its a 51-49%- hardly something to stand on. What I'm hunting for is more information on this hole. Bear in mind, to me the term "placed charge" probably has a different meaning- what I think you are talking about is just a charge put in a specific place. However, in this context there's quite a bit of difference between 10 inches and 2 to 3 feet. I'm trying to reconcile de Braeckeleer with Longtabber here, and I don't think it's too difficult. I think de Braekeleer's conclusions are suspect. Just for a bit of ad-hom, de Braeckeleer has also asserted that an ice-cube timer triggered device would never explode if placed in the baggage hold, which I believe is nonsense, and that an airliner flying from Frankfurt to Heathrow would not ascend to 34,000 feet, or high enough to trigger an ice-cube timer, which I also believe to be nonsense. So I wouldn't find it surprising if his conclusions from the Mach Stem Effect calculations were faulty. The distance of 10 inches favoured by de Braeckeleer really does put the whole thing in the melting point, because it would pretty much have to be outside the baggage container. And yet, the rest of the evidence supporting the theory that the bomb was among the luggage is so strong, it would take a lot to knock it down as far as I can see. In contrast, Longtabber seems to be assigning that 450g of Semtex a lot more destructive power than de Braeckeleer is, and thus allowing a greater distance between the charge and the skin of the plane. This would allow the charge to be inside the luggage container. His objections to the suitcase theory seem to be different, essentially that there was too much evidence to be compatible with stuff that was so close to such a powerful explosion. My suggestion as regards the "placed charge" observation is that the charge could well have been placed, by the person who placed the suitcase in the baggage container. 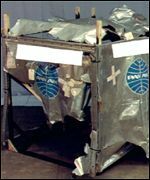 Remember, these containers where shaped to fit closely to the curvature of the hull of the plane (to maximise the use of space), therefore it would indeed be possible to predict pretty exactly where in the plane a case placed in a particular part of a container would go. A point I'd really like to get clear is, given the assumptions about the amount of Semtex and so on, how close to the skin of the plane would it actually have to be to produce the desired effect? There was a previous incident where a plane limped home despite damage, because the charge wasn't in the right place. If the charge was sufficient to have a good chance of downing the plane no matter where it happened to be placed in the hold, then the random loading in a baggage transfer isn't unfeasible, I suppose. However, if it really had to be right next to the hull to achieve the effect, I would have thought that was a very strong argument for the bag being loaded at Heathrow, the only place where anyone could possibly influence its placement in the hold. So really, I think we need Longtabber to look at the detail of the evidence that places the bomb in the Toshiba in the suitcase with Gauci's clothes, and try to reconcile that with his belief that the pieces are too large and insufficiently vaporised to have been so close to the Semtex. Let me tell you about "tests" ( I know you dont know this- but researching and refuting these "tests" professionally is one of the more enjoyable parts of my career- its challenging) I have reviewed them, conducted them, custom designed them. Since you dont have all of those- at best these "tests" are speculative hearsay. Each one of those will give you different results because you changed critical forces. So, for anyone to tell me a bright boy decided to pack anough pallets of boom sticks inside of a plane on the ground to watch it pop doesnt "prove" anything other than you have a good sized budget and get to play with fun stuff. Did they compensate for air frame stress and plug in the information of the plane in question? Duplicate the internal/externam temps and pressures? stresses from loading and fuel? My whole point is- ALL tests are suspect UNTIL you know for certain what they were testing for, how they did and all the factors they plugged in. I think a lot of the evidence is now in the public domain. The evidence that came out at the trial and the AAIB report certainly contain a lot of stuff. As I say, I haven't looked closely at the evidence placing the bomb where it was alleged to be, as I thought that was a part which was more or less undisputed. Nevertheless, I don't think it's reasonable to declare that this is all wrong without actually looking at it. The thing is, the people who did all this investigation weren't amateurs either. They were pros too. They could be wrong, they could be incompetent, but they weren't playing at it. I'm not saying they were. Something of this size to reconstruct and test is beyond super human. Lots of room for innocent error. That said- once you develop a theory and have key evidence to evaluate- theres little excuse for not running proper tests since these are common in industry everywhere. Custom or exotic tests- yeah, I can excuse them easy. I disagree slightly with this. The conclusions drawn from the evidence might be public domain, the evidence isn't. Leaving aside the fact that the physical evidence itself is long gone, even something like the AAIB report is a summary of thousands of pages of photographs, measurements, drawings and calculations. You would need access to these to be able to say with any confidence that the investigators had dropped the ball. I don't think there is much chance of these being posted on a website for us investigooglers to chew over. Fair comment. Still, how far can we go with what there is? That unfortunately is painfully but absolutely correct. I think de Braekeleer's conclusions are suspect. Just for a bit of ad-hom, de Braeckeleer has also asserted that an ice-cube timer triggered device would never explode if placed in the baggage hold, which I believe is nonsense, and that an airliner flying from Frankfurt to Heathrow would not ascend to 34,000 feet, or high enough to trigger an ice-cube timer, which I also believe to be nonsense. he said what? Say it aint so. Thats just plain stupid if true. So I wouldn't find it surprising if his conclusions from the Mach Stem Effect calculations were faulty. Something about his proximity based on the available information doesnt quite fit with me yet. I wish they had X rayed that hole. In contrast, Longtabber seems to be assigning that 450g of Semtex a lot more destructive power than de Braeckeleer is, and thus allowing a greater distance between the charge and the skin of the plane. probably because I've used it ( C4 but for discussion purposes, they are 1:1) a lot more. The thing is the quantity and thats speculation. Explosive calculations vary greatly depending on that. You cant say 2 lbs does twice the damage of 1. You get a slightly larger zap zone and a more intense one but as distance increases- force drops off close to the same. I would think that if 1 lb was 10 inches away- it would have taken out the whole section- not just blow such a small hole. That "hole" bothers me too because if it was in the baggage well with all the tamping from other baggage and internal structure- that "hole" really shouldnt have been there- it should have been more or a general rupture then peel back. His objections to the suitcase theory seem to be different, essentially that there was too much evidence to be compatible with stuff that was so close to such a powerful explosion. was it brought up properly and emphasized? I'm not sure we can go anywhere. What I was trying to say in my first post on this thread is that any alternative explanation for the bomb raises as many problems as it solves. The bomb in a suitcase scenario gives a (actually several) simple way of getting the bomb onto the plane. It ties in mostly well with the AAIB report (Longtabbers doubts, de Braekeleers sums, and the disputed status of the condition of the instructions and babygro excepted). A bomb anywhere else needs an explanation for how it got there, and who faked up the AAIB report to make it look like the bomb was in the Samsonite suitcase. Last edited by Guybrush Threepwood; 24th September 2009 at 08:23 AM. The bomb in a suitcase scenario gives a (actually several) simple way of getting the bomb onto the plane. It ties in mostly well with the AAIB report (Longtabbers doubts, de Braekeleers sums, and the disputed status of the condition of the intstructions and babygro excepted). Also, you have to put this in context with the time then. Security was nowhere near what it is today. Perhaps not in the way you think. The UK in the late '80s was not unfamiliar with terrorist bombs. I might have trouble finding it, but I did read that in one of his reports. Are we sure they didn't? There's clearly more stuff available. Here's a link to the court judgement as a single 82-page pdf. The conclusion reached by Dr Hayes and Mr Feraday as to the position of the explosive device coincided with that of Mr Claiden, and in addition Mr Feraday was present at tests in the USA. These tests involved the use of luggage filled metal containers and the placing of plastic explosives within Toshiba radio cassette players in a garment filled suitcase. The tests confirmed the opinion he expressed as to the position of the explosive device and the quantity of explosive involved. There's a lot more where that came from. It's not primary evidence but it does demonstrate what evidence was put before the trial. Well, what I quoted was from the actual court judgement, written by the judges, so it does appear that they noticed. They just hand-waved it away by saying that the cases might have been rearranged when the Frankfurt luggage was being loaded later. The official UN observer to the trial was horrified, and issued a very scathing report. On the basis of the above observations and evaluation, the undersigned has − to his great dismay − reached the conclusion that the trial, seen in its entirety, was not fair and was not conducted in an objective manner. He got even more critical in his report on the first appeal. 16. [....] If the evidence presented during the trial and the additional evidence made available during the appeal is analyzed in its entirety, it becomes clear to any rational observer that the theory of ingestion of the luggage containing the explosive device in Malta needs considerably more assumptions and is based on much lower probability than the theory of ingestion at Heathrow. In an entirely circumstantial case like the present one, this means that a determination “beyond a reasonable doubt” cannot honestly be made if one bases one’s argumentation and inferences upon reason and common sense. The trial verdict, confirmed by the appeal judges, would not stand a plausibility test in a scientific context defined by the rules of logic and reason. 18. It is impossible to understand why Lord Osborne finally was able to consent to the rejection of all grounds of appeal and why he did not follow the line of rational scrutiny of the trial judges’ reasoning. The unanimity of the decision of the Appeal Court is not plausible at all if one looks carefully at arguments such as those put forward by Lord Osborne in the course of the appeal hearings. What caused the appeal judges to make this rather drastic sacrificium intellectus of ignoring reason and common sense by rejecting each and every ground of appeal unanimously? 19. The Appeal Court furthermore failed to deal adequately with the substantial new evidence that was presented in the course of the appeal. In view of the many inferences and of the arbitrary, often contradictory argumentation of the trial court, the additional evidence would have had special significance for an honest reevaluation of the trial court’s argument. For unexplained reasons, the Appeal Court refused to deal with any other theory than that advanced by the Prosecution – which is all the more incomprehensible if one considers the evidence originally presented at the trial concerning the possibility of a bag (a brown Samsonite suitcase) having been ingested at Heathrow. He has since become a campaigner for a proper appeal and an independent inquiry. I need to take time to read more primary sources such as the court judgement and the AAIB report, as opposed to reading other people's theories, which sometimes contain incomplete or mistaken information. Well, if he did- he needs to stick with physics and leave electronics to us engineers. All I can say right now is that there is no expert listed with those qualifications and no mention of any Xray or heat effected zone inquiry- but I'm nowhere near thru either. That's not necessarily entirely true, when Europe and in particular the British Isles are concerned. We were very used to a lot of pretty elaborate security procedures at airports, in theatres and cinemas, and indeed everywhere, in the 1980s. When I moved to England in 1982 I was startled by all the bag searches and so on that I'd never experienced in Scotland - at first, naively, I assumed the security guards at the doors of the opera house were looking for illicit recording equipment! The point was, actually, that the IRA never targeted Scotland, so we never had to put up with all that stuff. It was SOP in England, and doubly so in airports. Heathrow would have been on normal IRA alert in 1988. Frankfurt was more specifically alert because it had been notified of what Khreesat had been found to be doing in October, and specifically that bombs disguised as Toshiba radio-cassette players were to be looked for. The same warning was lying on someone's desk at Heathrow, waiting for better photographs, when PA103 went down. We were all shocked to our socks in 2001 when we realised how lax US airport security was until that time. I think the US has kind of caught up since though. Contrary to Jibril’s statement, and surely he must know better, a bomb triggered by a gauge pressure set at 11,000 meters would not have detonated during the Frankfurt to London flight as the airliner does not reach cruising altitude on such short flight. Then again, such device would not have detonated at all if it had been located in the luggage area as the hold is at the pressure of the passengers’ zone and never drops below the pressure equivalent to 2,400 meters. I'm not quite sure if I got what he was saying quite right, but I still think he's wrong. I would love to see those tests and the details of all their testing parameters and conditions. Their general credibility has been seriously questioned in the course of investigations into the timer fragment, which might of course be relevant to any of the evidence they gave. I hate professionals that make such statements with nothing to support them- a professional knows his words carry more weight because of his expertise- nobody should do that. Theres a lot of room for legitimate suspicions here- maybe more than most people are aware because they dont design such tests. I certainly hope their test didnt soley consist of seeing how much stuff they could stuff in the belly of a jet and make a big hole in it. This is what I was talking about earlier regarding the anatomy of testing- if they dont have all these datapoints to build a case while establishing a legitimate probability or what may ( or may not) have happened and why- then the test was a farce. That alone makes me suspicious. I don't think it's quite as bad as that. Remember, he was talking about Jibril, and the specific devices found in the possession of Jibril's group. These seem to have been all the same, set to be triggered by a pressure equivalent to (IIRC) 940mB, and to explode 30 minutes later. We all know what Jibril had, and he knows we know, so to speak. It would have taken an airliner approximately 7 minutes to reach the height that would trigger these devices, and PA103 exploded 38 minutes after takeoff. Where I think he is mistaken is in believing that the pressure setting related to the actual atmospheric pressure at cruising height, rather than to the cabin pressure at that height. Also, in thinking that PA103A wouldn't reach cruising height on the Frankfurt to Heathrow hop. Which is bad enough. Its worse than I thought ( read the link now)- I'm of the opinion now this dude has mental issues and he is an "expert"? He is either a damn idiot, ego maniac or is following an agenda. That is the mother of all stupid statements. He is doing a sales pitch. ( that really alarms me) "All" timetables arent useless and a few minutes delay on a 3 hr flight if you set it at the 2 hour mark wont make a bit of difference unless the terrorist's real goal is to play "I want to drop my blown up plane in grid zone 3" and missed his mark by 200 km. That is just so idiotic. Theres a good one. I know its true because thats what terrorists tell me. Plus he is tainting his case- just because Jibril makes his bombs this way doesnt mean Habib does. Unless you know for certain this guy was involved with THIS bombing- thats also baseless speculation. I think I understand this a bit better now you've pointed this out. Bear in mind that Jibril was #1 suspect pretty much from the get-go. He was known to be heading a group based in Frankfurt which was making bombs which would blow up an airliner approximately 38 minutes after take-off. There's a lot more about Iran desiring revenge for the shooting down of the Airbus in the Persian Gulf earlier the same year, and the Ayatollah having paid Jibril's group to hit US airliner(s) in retaliation. Khreesat (the bomb-maker) even had a brown Samsonite suitcase. Approximately 50% of the Lockerbie CT theorising is aimed at showing that this theory was right all along, and it still seems the most probable explanation to me too. This is the "received wisdom" of the subject. De Braeckeleer on the other hand seems to have a different theory, which does not involve Jibril's group having done it, or even a suitcase being involved at all. Therefore he is trying to shoot down the idea that Jibril's devices could possibly have done it. Jibril, of course, is perfectly happy for him to take that line, and to feed him further "information" to help him on his way. He's completely ignoring that Jibril's group did actually blow up airliners in exactly that way. Well, I said way back before i actually started looking at this stuff that I have always felt Libya was at the most a conduit and the truth was elsewhere. Thats very consistent with a charge being in close proximity or either tamped to blow in that direction. So if you want something original, you're at least #6. Last edited by LONGTABBER PE; 24th September 2009 at 02:50 PM. The lack of pursuit of the PFLP-GC is quite startling, as it happens. Nearly as startling as the way the judges ignored all the evidence presented at Camp Zeist that would have made a better circumstantial case against them than against Megrahi. It doesn't even occur to you that this might be part of the CT, rather than a refutation of it? Well, he was in the business of supplying wholesale Semtex, that's for sure. You know what? While I have zero respect for the guy, I'd have more respect for you as a debater if you would just stop mangling his name. It brings you down to the same level as Cicero and his persistent, puerile, "MacAsskill". Sometimes I wonder if people have been out there dragging red herrings around deliberately. Last edited by Rolfe; 24th September 2009 at 03:16 PM. What do you think of this bit? (Par 6 of the court judgement). Technical evidence relating to the effects of explosives was given by Dr Cullis and Professor Peel. Dr Cullis is an expert on the effects of blast and the development of computer codes to simulate the effects of blast in particular different situations, and has been employed at the Defence Evaluation and Research Agency (“DERA”) since 1978. Professor Peel is the chief scientist for DERA, specialising in materials and structures used in aircraft, and leader of a team conducting research into inter alia the assessment of the effect of detonation of explosives in aircraft. They confirmed that 6 the presence of pitting and carbon deposits which would look like a very fine soot indicated a chemical explosion. The areas in which this would occur would have to be in line of sight with the explosive, and in particular, as far as pitting was concerned, there would have to be no intervening structure of sufficient mass to prevent explosive fragments impacting on the pitted area. The nature of the cracking in the floor panel of the container is typical of the sort of deformation which would be seen from blast loading, but the absence of pitting or sooting in that area would indicate that there must have been something such as another suitcase situated between the explosive device and the floor panel. On the other hand the pitting and sooting seen on the inner aspect of the horizontal base frame member of the container combined with downward deformation of that member confirms the view that the explosive device was situated above and in direct line of sight of that member and thus was likely to be situated partly at least in the overhang where the presence of a suitcase on the floor of the container would not inhibit the explosive products from striking that member. Further confirmation of the position of the explosive device came from the observation of crushing to the upper surface of the aircraft fuselage frame 700 and pitting and sooting of the two neighbouring frames, this being the area adjacent to the lower after end of the container. Professor Peel's evidence also included a substantial complex section on the nature of impulse loading, the critical level of impulse for failure of aluminium alloy sheet of the type used for the fuselage skin, and the calculation of both the stand-off distance and the size of the explosive charge from the size of the shattered zone and the petalled zone. These calculations indicated a charge of about 450 grammes and a stand-off distance of 610 millimetres, which would take the explosion 200 millimetres inside the container. We do not consider it necessary to go into detail about these complex calculations, as the physical evidence of damage to the hull, the container, and, as we shall see later, the contents of the container satisfies us beyond any doubt that the explosion occurred within the container, and the calculations serve merely to confirm that view. We should add that this section of his evidence also dealt with the effect, if any, of the concept of Mach stem formation, but we do not consider it necessary to go into any detail about that, as we accept his evidence that although that concept was considered as a means of assessing stand-off distance, it was not actually used. Last edited by Rolfe; 24th September 2009 at 05:39 PM. Thanks for finding that, I don't have your patience for trawling through long documents. That confirms my opinion earlier in the thread that there were multiple strands of evidence pointing to the bomb being in a suitcase in the container, in the location specified. If the bomb wasn't really there, then a lot of people must have agreed to fake up evidence that it was, which is where it all gets too CT for me. I just can't see any strong evidence that the bomb location is incorrect, nor can I see any questions that would be answered by having the bomb elsewhere, except "See, see!!! it's a cover up, they were trying to frame Libya all along! !OMG eleventy"
NB I do agree there is a lot wrong with the whole investigation and conviction of Megrahi, I just don't think this is one of the wrong bits. The Court judgement is actually quite readable, and although it's over 80 pages, it's double-spaced and you get through it quite quickly. Also, although it's a digest of the evidence, it is close to being a primary source. That's still my opinion. I can see where Longtabber is coming from. Sometimes you see a case which on the face of it just stands out as being quite obviously X. When you hear that someone else has diagnosed Y, you immediately declare, "no way!". Then you look at all the evidence they were looking at, and finally have to agree that, even though the superficial presentation is putting up an amazing imitation of X, an actual diagnosis of Y is pretty much inescapable. I actually do this in educational presentations. I present a case with a clinical history and a selected few laboratory results. I ask the audience what they think. They always go for the misdirect - at least for the first one or two cases, then they start getting wary of the trick. Then I reveal the full set of results, and point out both why the real diagnosis is far more compelling than the knee-jerk assumption, and how the "misleading" results do in fact fit into the pattern of the real diagnosis. The object of the exercise is to educate clinicians that they can jump to premature conclusions if they like, however they must never restrict their testing requests merely to a few tests they imagine will confirm their assumption. This is the run-up to explaining how to use tailored diagnostic profiling to ensure that you keep an open mind and acquire the information that will prevent you missing a diagnosis you didn't consider in your initial assessment. I would have thought that if there was any intent to frame anyone all along, it was the PFLP-GC who were being framed, particularly as regards the timing of the explosion. I just can't see how all that mountain of reconstructive evidence could have been planted. I mean, they re-built the bloody plane in a hangar from the bits they found scattered around the countryside. It's not just about the pattern of damage to the plane's hull, it's about the findings relating to the baggage containers and the other luggage. This seems to me impossible to fabricate. In addition, this stuff was all found and seen by a lot of people very early. If fabrication was carried out, it's inevitable that it was underway from pretty much the moment the plane went down. To plan and execute such an exercise, involving the manufacture of particular bits of damaged baggage container and substituting them for the originals.... sorry, this is 9/11 twooferism territory. Agreed. I don't think this could possibly have been fabricated. There's a big difference in plausibility between a single tiny fragment of circuit board only seen by a small handful of people having been introduced into the evidence trail at a later date, and the wholesale manufacture of bent, scorched and pitted luggage containers. I can't explain why Longtabber's opinion that any radio involved in such a blast would inevitably have been completely vaporised differs so sharply from the opinions of the explosives experts who looked at the Lockerbie debris, but as we can see, it wasn't just Hayes, Feraday and Thurman involved here, it was a number of highly-qualified experts, none of whom seem to have considered that a significant sticking-point. Several reasons- first the term "expert" doesnt impress or intimidate me because my credentials are in the same league as theirs and I routinely engage/challenge experts. They are human just like I am and there is no exact set of standards or protocols that universally apply. They "guess" just like the rest of us. Also, I've probably done more real world demolitions ( training and combat) than they have and seen it from the observer perspective even down to policing the area looking for any possible UXO remnants after the shot was fired. 3 controlled fires- 1 with just the radio, 1 in a suitcase in the open ( packed etc) and 1 with the suitcase in the center of others. High speed cameras and sensors everywhere. That would have sealed the deal- the fact it wasnt done but instead they just "ignored" or "discounted" it trying to push their opinion with no legitimate testing or verification really alarms me. I have a strong suspicion why they DONT want to have their theory tested.